This year, we had Christmas at Boyfriend's sister and brother in law's house. Jamie charged me with bringing dessert. I had a few ideas, which included making some delightful things known as "Grinch Cookies." Ashley at The Inspired Creative One posted the recipe on her blog, I found it via pinterest (of course) and I'm pretty sure she must be a genius. These cookies are ridiculously easy to make and incredibly tasty. I think my favorite thing about making these is that you use a Betty Crocker sugar cookie mix packet and, if you're in a hurry, that is a huge time saver. In order to mix the green food coloring into the dough evenly, I pulled on some food safe gloves and mixed everything with my hands. It was kind of therapeutic, haha. 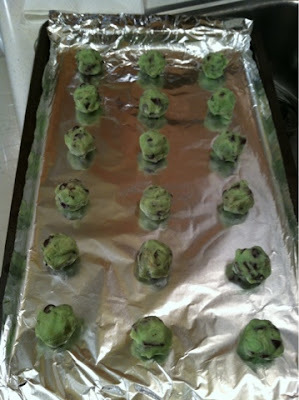 Once I had it well mixed, I used a teaspoon and my hands to make little balls of dough and placed them evenly on my cookie sheet. 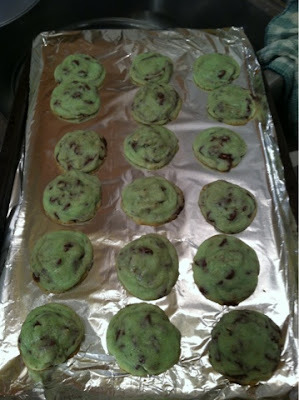 The results were delicious (and it yielded a LOT of cookies) and they went over really well on Christmas. I left some for Boyfriend's mom, some for Jamie and Jason and we took some home at the end of the day. 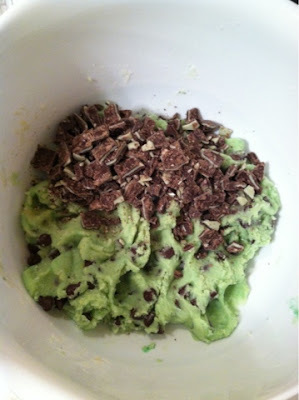 I'll be posting about my other Christmas dessert shortly. Stay tuned! !